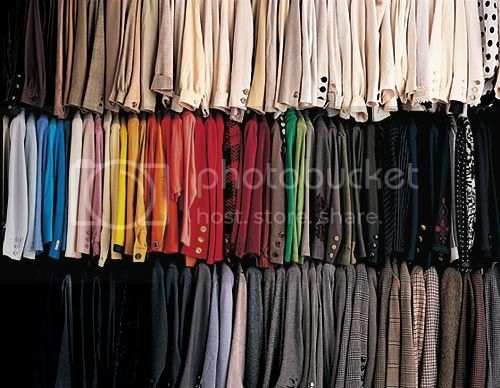 Photo of Nan Kemper's jacket closet. I currently have anything worn on the top half together by color, with no regard to the actual item. Then all long pants together, and then all skirts and shorts. Those are also organized by color. I hang all clothes (not sleepwear, or underwear) even tees and tanks. Although, I do keep sweaters folded on a built in wire shelving unit, those don't hang so well. I am considering switching to group by item, (cardigans, blouses, tees) then color, instead of by color only. So, tell me about YOUR closet! What works for you? Do you keep your closet organized by favorites, color, item or other? Fill me in! I am ready for a change. :-)!! Shorts, tanks and tees go in my dresser. Jeans are folded, back pockets out (so I can recognize them by the details) on a lower shelf. Sweaters are organized by color on a hanging shelf. Then, hanging, I have dresses in the corner, so their length doesn't compromise the floor space throughout. Next, I have skirts, by color, followed by dress pants, by color. Tops are separated into long sleeve and short sleeve, both sorted by color. I use a wide tie rack with clips to organize scarves and purses on the near end. We live in NC, so sorting by this method helps me best. In June/July/August, I'm not touching anything with long sleeves... so that section stays perfectly organized until cooler temps, later in the year. Well, my house is a wreck, but my clothes are now well organized. I have one dresser for workout wear only, sorted in the drawers by type/function. The other dresser holds t-shirts, tank tops, camisoles, shorts, and jeans, by fabric and color. The top of the dresser I share with my husband houses bras & underwear, with hosiery, nightgowns, and fancier lingerie in the bottom drawer. We share a closet, so I have the left side and 2/3 of the long bar. The side has a few jackets/coats and shrugs (depending on season) and suits or coordinates. The long bar has solo jackets first, then pants, then tops, skirts, and dresses, sorted by color and sleeve/hem length). My purses are on a rack that hangs on the inside of the door, and the shoes are on shoe racks on the floor, underneath the hanging clothes. I honestly need to pare down my wardrobe to about 1/3 the amount I have, but that's easier said that done. I now group my clothes similarly to yours, a recent change. I think I like it better than when I grouped by outfits. I separate tees and blouses from jackets and cardigans. Free shipping from Talbots via Facebook this morning and 20% off regular merchandise. The Facebook commenters were annoyed that it wasn't a better deal. I was glad to save enough on shipping to buy a garment. I hope our sale items fit. I was never one to organize my closet by color, until I tried it a while back. It made finding things easier for a while, but I didn't keep it up. I think it's time to try it again. I still keep jackets together, dresses together, skirts together, etc. I've considering hiring a company to come in and rig my closet to be more functional, but I think I'm too cheap to ever actually go through with it! I keep my pants in my dresser. In my closet, I have my tops organized by sleeve length: tanks together, short-sleeved together, long-sleeved together, then sweaters, blazers, cardigans, jackets. Skirts are grouped together and dresses are together. I live in a tiny house so I have to change out the closets a few times a year. There is one big closet in the hall outside my bedroom door. That's where the current wardrobe goes. I sort by item. All dresses together, all skirts, etc... Handbags are on the top shelf. Shoes are stored all over the house. I mounted a rack for belts and necklaces. I have the worst organized closet ever! I keep new things in the bag in the corner of a closet unless it came on a hanger until I think to wear it. I do hang most things but I place laundry directly in the middle, which means I have lots of things I like that I can't easily get to when it's time to wear them. I'm dedicated to correcting this in my new place though. I do not hand jeans or sweatshirts or undershirts (tanks) or loungewear (sweatpants and the like and T-shirts) - these are all in drawers in my closet or on shelves in the closet. My first post was of my closet if you want to see pictures. I can't wait to hear how you are going to re-organize your closet! The closet in the picture is half of mine where I group things by color then style within the color sleeveless, tshirts, blouses, long sleeved things... I fold pretty much all of my pants and heavy sweaters. This makes it a breeze getting ready in the morning! I organize by garment type - pants, skirts, jackets, blouses & dresses. Then I put them by color, white to black. However this year I started a middle section for items I want to wear asap. That small section includes select pieces from my jackets, dresses, tops and pants. I got closet dividers like these to separate the different groups. I *really* like those. Most of my sweaters are folded & in sweater bags. I also use cedar spray on everything. One day I'll get around to a closet organization post.